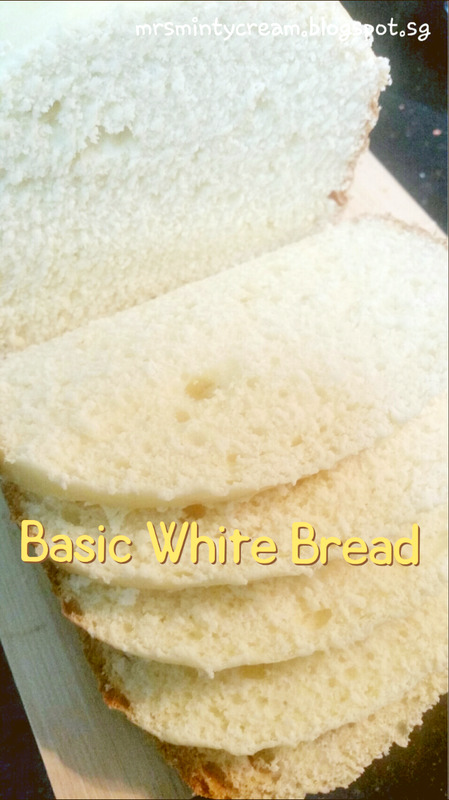 The Basic White Bread, one of the first few recipe any home baker will make upon receiving their first bread machine. I am no exception, other than the fact that I was not able to get it right in my first few tries. Haha. I have to be honest. The initial few tries was frustrating for me. I just could not get it right. 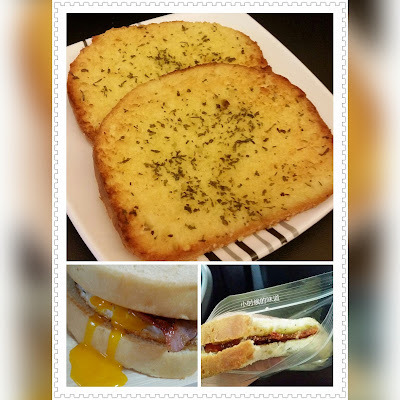 Sometimes it was the incorrect proportion between the wet/dry ingredients, sometimes it was due to insufficient proofing (using standard mode in BM) and sometimes I just could not figure out what was the reason behind the failed attempts. Somehow the first few loaves of bread I have gotten out of the bread maker was just way too flat for my liking. I wanted something that was tall, light & fluffy. It was weird. 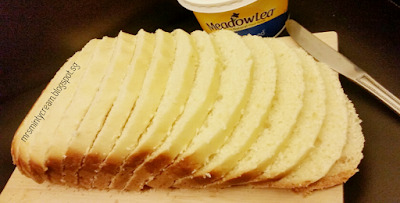 I had no such problems when using the bread maker for kneading & proofing before shaping the dough & finishing off with baking in the oven (See my Cheesy Corn Pull-Apart Bread (#41)). It was just loaf bread that was giving me such a headache. After my 5th try, I finally managed to get a loaf of Basic White Bread which I was satisfied with. 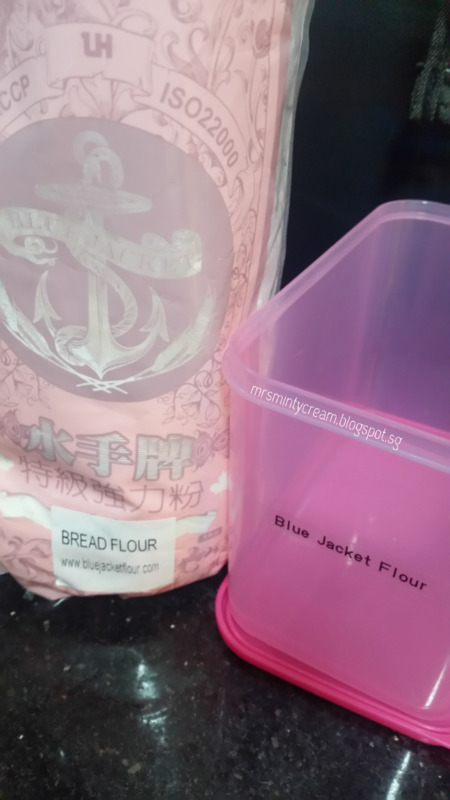 Thanks to this modified recipe as well as this really good Blue Jacket Bread Flour from Taiwan. I was finally able to get a decent height in my loaf and soft & fluffy too! 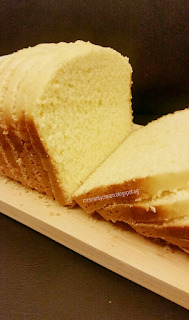 I love having a good recipe for Basic White Bread on hand. 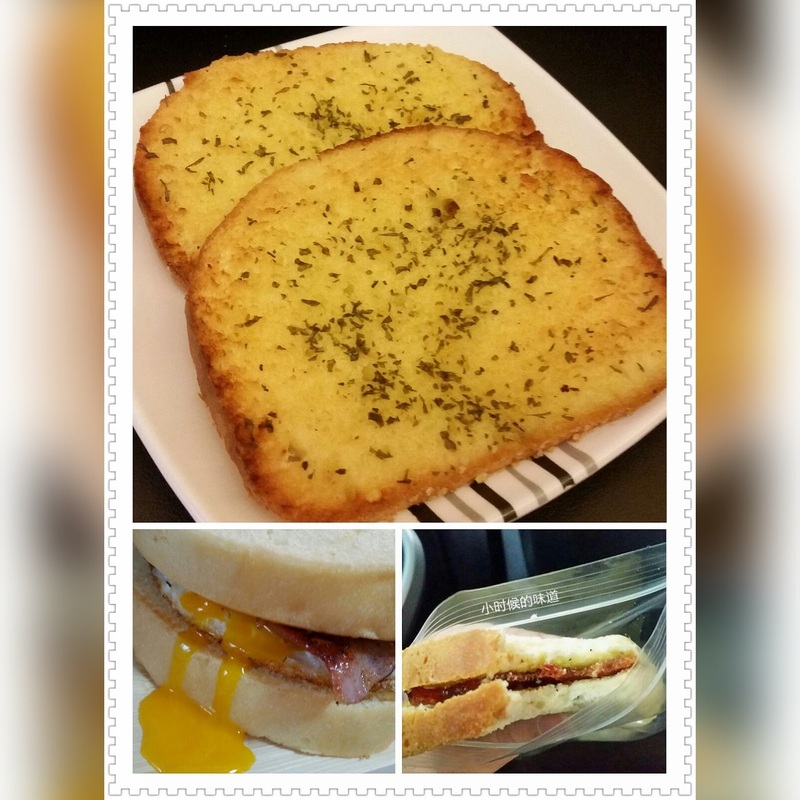 This has allowed me to pair the white bread with its fanciful counterparts so to prepare different sandwich combos for my morning breakfast! It is so much fun. This is such a morale boast to me. I shall continue on this route of yielding taller, softer & yummier bread! 2. At each corner of the bread barrel, add in sugar, salt, beaten egg and butter. 3. 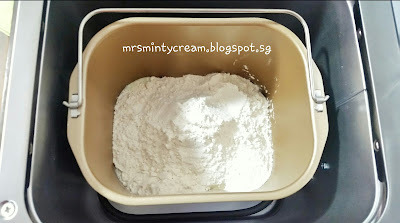 Add in the milk powder and bread flour on top of the wet ingredients. 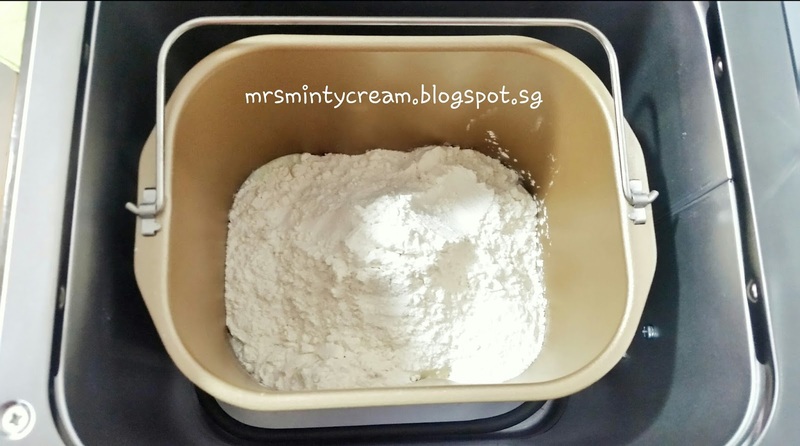 Make sure the wet ingredients are well covered by the flour. 4. In the centre of the flour heap, dig a hole and add in the instant dry yeast. 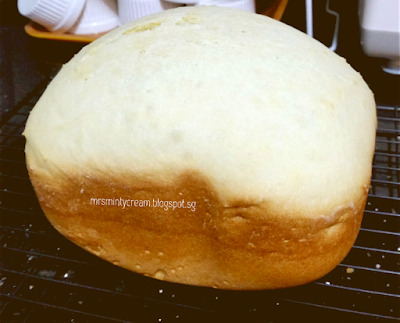 Cover up the yeast with the flour. 6. Select "Custom Procedure" function on your bread maker(On my Donlim T15A Breadmaker, I selected function "21") and input the following settings before pressing "Start". *After second kneading, paused the machine if you wish to remove the kneading blade from the bread barrel. Do this before the dough undergoes second proofing. 7. When bread is ready, remove bread barrel from the machine immediately. 8. 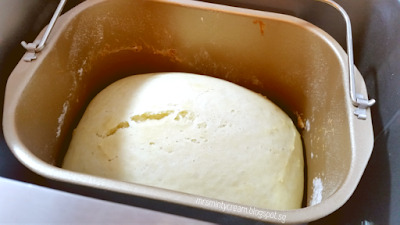 After removing bread from bread barrel, transfer it to the cooling rack to allow it to cool completely before slicing and serving. 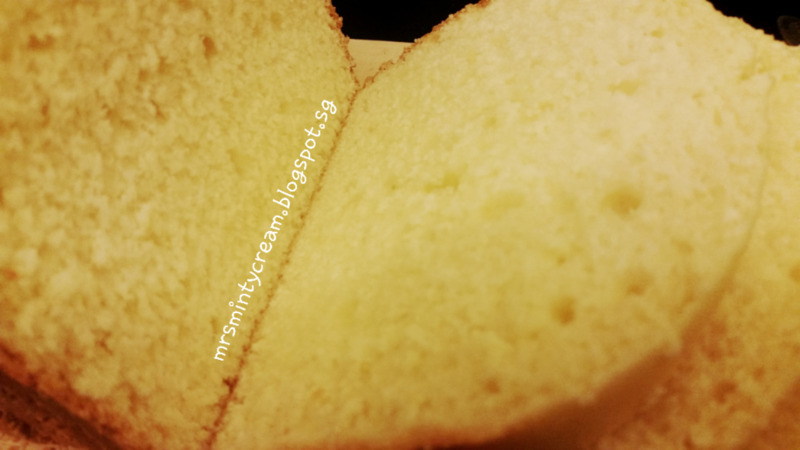 My breadmachine bread almost always comes out sunken on the top even it rises to a nice curve before baking. I have no idea why it is so. Do you have any explanation or suggestion to overcome it? Mine is a Noxxa breadmaker which I got about 15 years ago. I've misplaced the manual. I just follow the instructions on whatever recipe I get from the internet. Many thanks.